Save money by parking on the Venetian mainland and taking a public water bus to Venice's historic center. 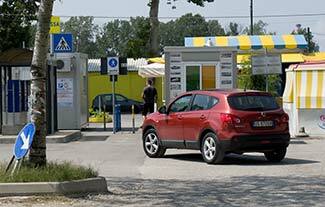 Parking in Venice can be expensive: The last time we checked, a day's parking for a normal car was €21 at the Tronchetto parking garage just outside the historic center and a whopping €30 at the Garage San Marco in Venice's Piazzale Roma. If such rates are too rich for your travel budget, you may prefer ASM Venezia's San Giuliano Car Parks on the Venetian mainland, where the daily rate for cars is an astonishing bargain by Venice standards. In addition to saving money, you'll avoid the risk of getting stuck in a traffic jam on the causeway between the mainland and Venice on a busy weekend or during high season. ABOVE: A car leaves the Porta Gialla parking lot at San Giuliano in Mestre. INSET BELOW: A path in the Parco San Giuliano, and the Porta Gialla or Yellow Gate. The Parcheggi San Giuliano along the edge of the Parco San Giuliano in Mestre, a large regional park that you'll see across a canal on your left as you approach the causeway to Venice. The park has three public lots: red, blue, and yellow. From the park, you can catch a bus to Venice. For more information on the parking lots (including hours, rates, and a downloadable map), see the official San Giuliano Car Parks page. Warning: Ignore touts in official-looking caps who may try to stop you as you approach San Giuliano. They're scam artists who'll try to charge you for taking your car and parking it in an unattended (and possibly illegal) area.